From the Promise Collection by Love Story®. The Charlotte Engagement ring features a delicate diamond-encrusted white gold band that gently surround its round brilliant cut diamond center. Our signature Love Story® logo and diamond are embedded in the shank. 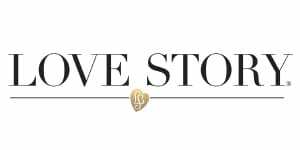 "CHARLOTTE" 14K WG 1/2ctw Diamond Engagement Ring; 1 - .40ct Rd Ctr., 16- .006ct Rd (all I/I1 min) DWT = 1.81 From the Promise Collection by Love Story®. Diamond in shank logo.